♥ i heart craft ♥: Finally something for the boy! Its an "N" for his door. When we finally move and he gets his own room we will be decorating it with a jungle theme. 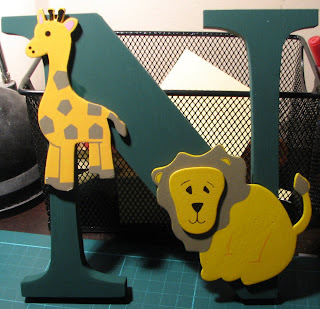 Hence the giraffe and the lion, der! LOL? Please ignore the glue smudge near the giraffes neck, its annoying the beejesus out of me, but will have to do... HOPEFULLY no one will notice it when its on the door. I love the giraffe...it's cuteness definted! no, can hardly see the glue stain, so don't worry! That is gorgeous - very clever.